In the past few days, we have received thousands (not hundreds) residents letter to FAA, and we would like to share just a few of them to the public, and make sure that FAA needs to know that when they say they are accepting public comments, they better mean it. We are Sunnyvale residents and we are against BVA due to the following reasons. Surf Air started using San Carlos Airport in June, 2013. Within a few months, 24 households filed 49 complaints. In Nov. 2013, Mayor Elizabeth Lewis submitted a letter to request FAA researching for a new flight route. In her letter, she stated: “Ideally this new approach would be further east of the existing straight-in approach, possibly over the HWY 101 corridor, WITH CARE TO NOT CREATE FLIGHT NOISE OVER OTHER NEIGHBORHOODS.” (1) On Dec 9th, 2013, a new alternate flight route (now so called BVA) was presented on Atherton’s Town Hall Meeting. (2). So, BVA was initiated due to total 49 complaints from 24 households in Atherton. 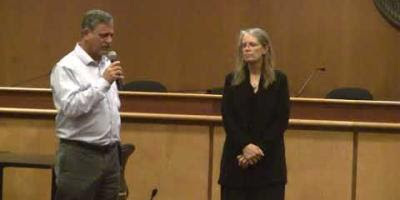 Also, the youtube video BVA missteps admitted by Jim Porter is the video clip of Jim Porter, director of San Mateo County Department of Public Works, making a public confession that night about the missteps they've made in regard to BVA. On Sept. 27th of 2017, more than 9 months after the proposed trial ending date, FAA held the first Community involvement meeting in San Jose and announced nothing of the BVA trial. Moreover, San Mateo County recommended the unofficial BVA route to be approved as an all-weather VFR approach and an instrument procedure (chartered visual approach) available to all operators. What was the reason that Sunnyvale residents were never informed before, during, and nine months after the trial? We demand a second community involvement meeting in SUNNYVALE! Also, there were many seemingly conclusive numbers presented by FAA and San Mateo County and San Carlos airport, for example, airport’s noise mitigation measures, study, and research set up for solving San Mateo residents’ complaints. Why don’t we see any proposals or reports addressing Sunnyvale residents’ noise concerns? The complaints to SQL before the trial (01/01/16-07/04/16) were 1,684 in total. (Table 1)During the BVA trial, San Mateo County alone had 6,229 more than any complaints in the past, which indicated that BVA trial could not solve the noise problem for San Mateo County residents. Also please see the chart 1 enclosed attachment below, during the trial period, no matter what percentage BVA flight route was used, there were always 20 to 40 households filing complaints. In 2013, a new flight route was created at Atherton Townhall meeting due to 24 household's complaints about newly established Surf Air's flights. So, San Mateo's # of complaint households grew from 24 households in 2013 to 30 households( Average # of complaint households) in 2016 during BVA trial period. Sarcastically, in week 16, Surf Air’s flights used 80% BVA flight route, there were even 89 households more than average # of complaint households filing complaints. That means BVA flight route didn’t solve Surf Air’s airplane noise at all. 1. On the contrary, during the trial period, the total complaints and # of complaint households from Sunnyvale increased dramatically, from almost none to 15,050 and 102 households. This is a clear indication that BVA cannot solve the noise problem for San Mateo, but push Sunnyvale residents into a deep devastation. 2. If San Mateo could initiate the new route trial in Dec of 2013 based on 49 complaints received, Sunnyvale’s 15,050 complaints should be more than enough to stop BVA and try other alternatives. The dramatic increase in complaints is from affected Sunnyvale residents living below BVA route including north and south portion of the city, which has expressed people’ opinions loud and clear on the attempt of implementation of new flight route. BVA impacts approximately 15 miles of heavily populated residential areas from Campbell all the way through Sunnyvale. On the contrary, San Mateo complaints were concentrated along the GPS approach, 4 miles southeast of the Airport. The enclosed 3 pictures made a crisp comparison of the GPS approach and BVA approach. 1. Provide us a clear timeline, schedule, process, and parameters for making the decision of BVA route. 3. Give a complete original GPS route map to see which part of Sunnyvale was previously being impacted by GPS route as San Mateo County claimed. We, Sunnyvale residents, are against BVA route! BVA doesn't solve surf air's airplane noise for San Mateo county at all but push Mountain View, Sunnyvale, and Cupertino into a deep devastation. Please have a global solution instead of noise shift. Thank you so much for your consideration. You time and efforts on helping Sunnyvale residents will be greatly appreciated. SQL Charted Visual Flight Procedure Briefing (PDF) - only presentation without much text information and without any speaker notes. SQL Community Workshop (PDF) - only text information without any speaker note. The BVA for SQL page at FAA.gov did not specify what is the existing flight path to SQL at all. Any impact report should evaluate the “No Change” option. What would be the existing flight path? This should be clearly and factually stated in the impact report for transparency and accountability. By NOT providing any information on the existing flight path taken by SurfAir in 2015 or earlier, FAA is depriving me of my right to make a fully informed comment on this BVA flight path. The FAA website on BVA for SQL states “Pilots must have a charted visual landmark or a preceding aircraft in sight, and weather must be at or above the published minimums.” From the definition of BVA, it is prone to human error and potential misuse, just like traffic accidents always happen. Please evaluate the potential impact of human error (not paying attention, for example) and the potential impact of potential human misuse (not following rules). Please estimate the potential impact of accidents when using BVA on property and human lives. The FAA website on BVA for SQL states “When following a preceding aircraft, pilots are responsible for maintaining a safe approach interval and wake turbulence separation. Pilots must advise ATC if they are unable at any point to continue a charted visual approach or if the pilot loses sight of the preceding aircraft.” From such description, the safety of BVA is subject to pilte judgement. How would the discipline of pilots be ensured? What would be the penalty if the pilot did not follow the prescribed procedure or take the stated precaution? What instruments would there be to detect such violation of stated safety requirements? What would be the impact on human lives and property damages if there is any pilot error, intentional or not, detected or not? This figure from “SQL_Charted_Visual_Flight_Procedure_Briefing.pdf” shows that the BVA path would cut through Cupertino. But the image on the FAA website showed an intentionally obscure image without showing the path cutting through Cupertino. The image on the website is very misleading or one might think it is not truthful. Many members of the public might not have commented due to this obscure, possibly untruthful image. No change. Follow the Blue path. 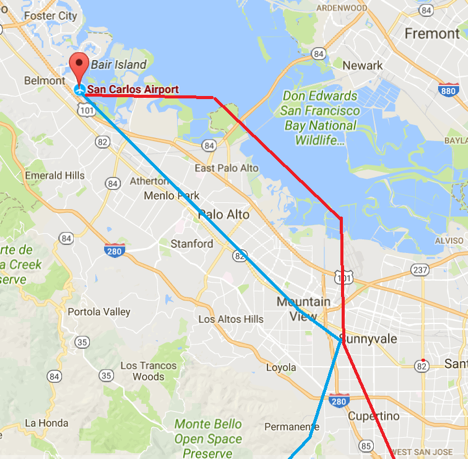 Use the blue path from southwest to the waypoint in Sunnyvale and then take the BVA path. Move BVA path going through North Sunnyvale a little bit west so that it follows Rt 85 to reduce the number of residential homes impacted. Also reduce the number of homes which are impacted by multiple sources of airplane noise, especially South Flow from San Jose Airport. If multiple options have similar impacts in terms of safety, please consider the density of population living under the flight path and consider the cumulative impact from multiple airports when selecting one flight path to use. If the two preferred paths (a and b) are not considered, please provide ample reasons with documents that those two paths would not be safe under FAA standards. Possible noise towards existing community is not a reason for not considering an option since all options affect some community. The "SQL_Fact_Sheet" by FAA specifies that "The FAA does not own aircraft, nor governs how many flight operations an airport chooses to conduct before reaching airport maximum operating capacity." Since the FAA has no way to limit the number of flights eventually would use BVA, the impact analysis report should evaluate the impact on safety and environment (such as pollution and noise) for both moderate use and maximum use. Since FAA has no way to limit the number of flights flying over Cupertino and Sunnyvale to and from all other airports, such as San Jose Airport, Oakland Airport, Palo Alto airport, San Francisco airport and Moffet Tower. In the impact analysis report of BVA for SQL, please analyze the maximum impact from all airports so that you can get a realistic impact a few years later when the operation of all these airports expand to accommodate the economic and population growth of Silicon Valley. For San Jose airport, please especially evaluate the impact on South Flow days in the worst case. SQL is located in San Carlos. The income from SQL goes into the city of San Carlos. The residents of San Carlos and San Mateo County have a direct communication with SQL and Sur Air in case there is any issue on issues like curfew or noise reduction measures. However, residents in remote cities like Cupertino or Sunnyvale, located in Santa Clara County, do not have a direct communication with SQL or San Mateo County, as it has been proven again and again. Voices from Cupertino and Sunnyvale have been ignore in the past and they will be ignored in the future until it escalates. Therefore, using a flight path that goes through more cities and more counties create future administrative problems in case of complaints and especially on supervision on whether pilots are following specified requirements and time schedule. Please estimate the amount of extra administrative cost for flights landing in SQL to go through South Bay cities, such as the cost to contact all city and county governments and cost of involving all city residents. Please also provide strategies you will use to ensure that voices from all cities will be included in any future operational change in SQL, such as an increase in the number of flights or change in flying schedule. Please also provide strategies for two-way communications with residents of other cities so that the frustration we have experienced in 2016-17 would be avoided. Since San Mateo County and SQL airport are the parties who will benefit financially from Sur Air flights, please disclose the financial benefits to these parties annual now and projected benefits as the airport expands. The result tends to be biased towards affluent neighborhoods and against neighborhoods whose residents do not have the time nor technology to file complaints. In an area like Cupertino and Sunnyvale, there are multiple sources of airplanes going through our air space. We are required to identify the destination of each flight producing noise and then go to the website of the specific airport to complain. This is not only time consuming, but also impossible for people who do not have the technical knowledge to file complaints. Then, once complaints are filed, the airports like SQL and San Jose find other ways to disqualify complaints. But airplane noise on a flight path should NOT be measured by complaints in the first place. If the same flights flying at the same distance get lots of complaints when going through San Carlos, you should expect the same number or even more complaints when the same flight goes through Sunnyvale since the population density there is higher. You should not depend on the number of complaints to evaluate a new flight path. The areas near North Sunnyvale more heavily impacted by airplane noise due to lower altitude and when the plane changes direction should be more heavily impacted. However, that area tends to be the area whose residents might not have the time or technical knowledge to file complaints. Install scientific equipments to measure airplane noises. If Sur Air or San Mateo County are requesting the flight path change, they could pay for the equipment for the measurements on both the previous flight path and the proposed one and maybe other alternative flight path. It’s only fair. Take a random survey of 100 people from each geographical area with similar economic background. Assume that they heard a flight pass by with a noise they would like to complain. Seel how many of them would be able to figure out whether the plane goes to SQL or not. See how many of them would be able to figure out how to correctly file a complaint to SQL specifically. If 2 out of 100 can file a complaint to SQL correctly, you should multiply the number of complaints you receive by 50. An airplane doesn’t appear out of nowhere. It follows a flight path. If there is one complaint filed by one household on the flight path, every household from that point to SQL should be automatically entered into the complaint database since the noise level experienced by the rest of the household could only be higher as the airplane descends towards SQL. A scientific method to measure noise should not be based on isolated sample. Please specify the method FAA has deployed to inform residents impacted by BVA about this BVA for SQL proposal. I only heard about BVA from private social media group. There has been no notification from my city government. No postcards from anyone. No news or radio or any other announcement to inform residents on the commenting period. Once established, would BVA be used by any other flights going into other airports? If so, please evaluate the noise and risk impact assuming the maximum usage of BVA. Many Cupertino and Sunnyvale residents were not aware of the 6-month trial period for BVA. Some became aware of it due to the increase in noise, but they did not know how or that they could complain until much later. As a result, any “complaint-based” measurement on noise would significantly underestimate the noise impact due a lack of information. FAA told the audience that they would not change flight path to move noise from one community to the next. But this slide below from San Mateo County says otherwise. It shows that BVA is intended to reduce impact for 140,000 residents in San Mateo County. But BVA the red path, as shown above, would impact Cupertino and Sunnyvale with similar population. San Mateo County certainly did not involve the public in Santa Clara County until the very end of that process, when a new flight path was proposed. If the purpose of BVA is to shift airplane noise to another community, especially who already suffer from airplane noises of multiple airports, FAA should not even consider such a new flight path since it is against the stated FAA principal.